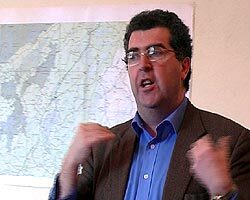 Keynote talk by Dr. Pat Nugent at the Aughty People and Earth Day in Crusheen, 22nd April 2006. Dr Patrick Nugent, B.A., B.Ed., Ph.D. is a lecturer at the Irish Studies Institute in the University of Liverpool. He has published both in the Irish and English language on subjects ranging from the clan system and territorial organisation in the late medieval period to sean nos singing. His research interests include the transformation of Gaelic society from the sixteenth to the eighteenth century. His Ph.D. on 'A Historical Geography of the Transformation in the Territorial Organisation of the Gaelic Society in County Clare during the Early Modern Period' will soon be published. The Slieve Aughty Region - how do you you define it? Well, basically there are a few different ways of defining it. One is actually to do it by roads. So on the map I would take the southern boundary as going from Ennis over as far as Whitegate. Then I would take the eastern boundary as going from Whitegate up to Loughrea. Then I would take the western boundary as going from Loughrea down to Ennis again via Gort and Crusheen and so on. So that would be one way of defining it. Another way of defining it would be to look at the parishes. What parishes are within this region what parishes are outside it? Another way would be to simply to define it by altitude. On the map I handed out there if you follow the five hundred foot - apologies it isn't metric - contour, you get a picture of the area that has a truly upland aspect to it. The Slieve Aughty uplands is an extensive marchland - this is an historical word used to describe a borderland between two regions. The Slieve Aughty upland region is almost evenly split between South East Galway and North East Clare. The uplands originated during the Caledonian mountain building phase of around 350 million years ago when tectonic activity resulted in the uplifting and crenellation of Devonian Sandstone rock. Devonian Sandstone rock is the result of millions of years of erosion of rock particles which are then transported to the sea by rivers. The particles are suspended in the running water and become deposited on the ocean floor when the force of the running water is negated by the ocean tide and current regimes. Consequently, a considerable depth of rock particles accumulate on the continental shelves. Over millions of years the pressure of the accumulated rock particles results in the formation of sandstone rock. Then you have tectonic activity and you have this uplifting. The original height of the Slieve Aughty at the time they were uplifted is thought to be around 5,000 metres. It has taken about 350 million years for them to be eroded to their present height. The Slieve Aughty mountains consists of two ridges divided by the Owendallaigh river which flows into Lough Cooter (Cutra). The Gort/Portumna road runs along this valley. The highest point of the Northern ridge is Casileandrumleathan at around 1,107 feet. A wind farm has been located to the west of this summit in the last few years. This ridge is entirely located in County Galway. The highest point at Maghaire (Maghera) 1,314 feet is situated just south of the Clare/Galway county boundary on the western wing of the southern ridge. This modest peak is separated from the remainder of the ridge by a U shaped valley. Lough Greaney - the mythical Lough Greaney -occupies this valley. The low Caladonian-fold mountain ridge continues eastwards to within three kilometres of Lough Derg reaching the modest heights of 993 feet, 1,124 feet and 1,143 feet at Knockbeatha, Cappabaun and Scailp, respectively. The county boundary meanders through this part of the ridge. Devoid of tree cover and lacking the people to cultivate the region after the great famine - the underlying poorly draining Devonian Sandstone assisted the then quotient of substantial blanket bog coverage. Erosion problems are still ongoing, aided at present by extensive plantations of coniferous trees which accelerate the rate of run-off. The woodland cover, before it was extensively removed in the 17th and 18th centuries, was overwhelmingly deciduous. Up until the early 17th century, the Slieve Aughty area was heavily wooded by deciduous trees. These trees were then cut down progressively and by the Strafford survey of 1637/8 you will find that the tree cover has been reduced substantially in the lower regions of Slieve Aughty. It was still significant in the upper regions. Population levels following the Cromwellian campaign of 1649-53 was extremely low. The influx of transplanted papists chiefly from Limerick, Tipperary and Westmeath from 1654-6 offset this decline to some degree. The population grew steadily throughout the 18th century. Given this population growth, some people began to move into the uplands. Bit by bit the woodland cover was cut down. So by the time of the famine there are almost no forests in the Slieve Aughty region. It was completely denuded of forest and it is actually quite heavily populated. The parishes of Feakle and Ballinakill are two of the worst affected parishes in Ireland during the famine. Within five years they lost over 50% of their population. Within ten years the population of the Slieve Aughty region drops dramatically. In fact it is probably the 'black spot' within the west of Ireland which suffered the greatest populations losses in Ireland both numerically and proportionally. After the Famine, the population just dwindles and dwindles and dwindles. The forest cover is gone and it is only in the last 50 years that you have this coniferous plantation coming along in its wake. And they are, if you like, out of character with the natural vegetation of the area. But the nature of these forests has its own dynamic. Just to go back - how do we know that the Slieve Aughty was heavily wooded in the past? One of our earliest references - and it's not that far back - goes back to the epic poem called Caithréim Thoirdhealbhaigh - which is the wars of Thomond. It was written by a poet called McCraith - Sean Mac Ruaidhri McCraith. And this particular poem was written around 1350 AD. And it is a type of chanson de geste, a kind of epic narrative of a memorable event. The memorable event in question is the O'Briens' wars with the Normans. The mid fourteenth century composition date is based on the examination of the genealogy of the hereditary seanachaí family, the McGrath clan. Flower - who has done most work on this - surmised that Sean was the son of Ruaidhri, the poet mentioned in the actual text of burying the dead after the battle of Corcomroe Abbey in 1317 AD. So I am going to quote a few selected passages from this publication, which was translated in a very florid style. Standish Hayes O'Grady, the late 19th century antiquarian, deliberately used this style in English because he said it reflected the nature of the Irish (language) text. In the 14th century, woodlands are not perceived by the Gaelic clans as hostile. This reflects the Gaelic ideology of the environment. If you look at medieval Europe; if you look at the French and German medieval period, the forests are areas of fear. It's the area where horrible things happen, where mysterious creatures live. But if you look at Gaelic poetry, we don't have this fear of the forest at all. In fact we revere them. The forests are a place to be cherished. Not only because they are places of refuge during time of war but also because they played a special role in Druidic tradition. The forests are where the Druids carried out their rituals, so they have a spiritual element to them as well. This reference notes the MacNamaras escaping from Brian Rua O'Brien's forces. Now if you look at the War of Turlough it isn't a straight fight between the O'Briens and the Normans at all. In fact a lot of the poem is taken up with the O'Briens and the MacNamaras having a fairly hostile relationship to each other. And initially you will find that the O'Briens are fairly compatible to the Normans and it's only later on that they become active in getting them out of the county. lofty hill, paped peaked vastness. Now this type of gross overstatement of reality was the type of poetry that was written at that time. "Lofty hills" - I'm not quite sure. "Papped peaked vastness", "deep valleyed"? Well, I'm afraid the valleys in the Slieve Aughty region aren't that deep. and the woods of Ferbane in Tulla. We know that Inishcealtra was wooded as well. This 14th century poem is the first concrete reference we have to woodland. But then when you go to the 17th century we have the Strafford survey, which was carried out in 1637/8 and which I mentioned previously. And the reason for the Strafford survey was basically to confiscate the land in Clare and Galway, Roscommon and Mayo, and to have a plantation scheme in these four counties similar to the Ulster plantation scheme of about thirty years previously. So the Strafford survey is an incredibly detailed survey of land. It is remarkable. In Clare it goes into every single land denomination (townland) as they are called, and it classifies the land into profitable and unprofitable. And then it uses 121 different land descriptions to actually describe the land. Twelve of those refer to woodland. Some of these are old woodland, some of these are new timber wood, dwarf wood, decayed wood, and many varieties in between. So you can build up a picture of woodland cover in Clare at that time. And the two parishes that come out with the heaviest cover are Inishcealtra and, strangely enough, Kilraghtis, which is present day Barefield. But the nature of woodland cover in Barefield and Inishcealtra is quite different. Inishcealtra, over around Whitegate, was described as having been covered by tall deciduous trees. Barefield was covered in dwarf wood. Dwarf wood probably means bushes. This was the woodland cover of this particular area. So the general picture you get in the 17th century - you get other indications - some of the older wood has been cut down and you have new woodland taking off. The general indication is that the woodlands in Clare had decreased significantly. The Cratloe woods that are famed in the late 16th century are basically gone, but in the Sliabh Aughty area there is still significant woodland. Last week, or a few days ago, I looked at the Book of Survey and Distribution for South Galway as well, and you get the same picture of heavy or extensive woodland in the parishes of Ballinakill, Killenadema, Kilthomas, Kilbeacanty and parts of Beagh. All of these five parishes - their woodland profile is similar to the parishes of Feakle, parts of Crusheen, northern Clooney and Tulla. Killenadema and Ballinakill have extensive woodland areas where you get the impression that there is no population. What happens when the Cromwellian period arrives? First of all the Cromwellian campaign in Ireland results in around a third of the population being lost either by disease or the military campaign itself and of course the well known deportations to the Caribbean. So the population of Ireland drops significantly. Now in Clare and Galway and Roscommon this loss of population is offset by the transplantation scheme. The plantation scheme is basically the scheme that the Cromwellian administration devised to rid the rest of Ireland of its Catholic population and make them go - if you like, the famous - across the Shannon into Connacht, or 'to Hell or to Connacht' as the phrase has emerged. Now this involved a detailed analysis of who was to be transplanted in the rest of the country and then basically these people were required by law to travel west of the Shannon by a particular date. When you examine the transplantation certificates you discover that only about a third of the people who were meant to be transplanted actually travelled. What happened the rest of them - the ones who stayed behind in Tipperary and Kilkenny? Well, basically they decided that they'd opt for being tenants of New English or Cromwellian landlords, but what you do find in East Clare and in East Galway is a significant influx of transplanted papists from Tipperary, Waterford and Limerick - these are the three main counties - about 50% of transplanted papists in South Galway and East Clare are from those three counties. When a transplanted papist family like the Powers move in we'll say to Clare, or the Barrys move into Clare, they don't come on their own. Its not just the father or wife and a few children. Their servants come as well. So you can actually have a significant influx of people. So the drop in population after the Cromwellian campaign is offset by the incoming transplanted papists. Now, where were the transplanted papists put? Well, the Strafford survey which had been carried out about fifteen years beforehand was now used as a way of identifying lands in which to put the transplanted papists. So, you'll find that local people are being moved sideways to make room for the incoming transplanted papists. In the Crusheen area you will find that the Butlers are transplanted papists and the people who lived there before that wer being pushed to the side. Now, sometimes this meant either staying in situ and becoming tenants of the incoming transplanted papists but other times it meant people moving into the marginal lands. This probably resulted in Slieve Aughty uplands being used in a more organised fashion. So throughout the late 17th century and early into the 18th century the population grows steadily. The Slieve Aughty region was an area free for population movement. So bit by bit the dispossessed, the people who have been moved sideways are moving into the uplands and claiming them for themselves. So I have looked at who were the people in this region before the transplanted papists. On the Clare side, you can identify key families in the different parishes. At the top of the social pyramid in Clare you have the Earl of Thomond, which is one of the O'Briens. On the top of the social pyramid in Galway is the Earl of Clanrichard which is one of the Burkes. Below that you have a host of other lesser nobles. The lesser nobles in Clare would be the chieftain of the MacNamara Reaghs who are based in Feakle and Tulla, the Earl of Cork, who is an absentee landlord but he owns significant lands particularly over around Mountshannon. On the Galway side you have a guy called Sir Roger O'Shaughnessy, who is one of the O'Shaughnessys around Kilmacdough, then you have the Earl of St Albion who I never heard of, I just saw his name there, and the Earl of Clanmorris. Clanmorris is a barony in Tipperary. What was he doing with land up in Galway? I don't know. Knowing that the Earl of Cork is an absentee landlord I am making the assumption that the Earl of St Albion and the Earl of Clanmorris are probably absentee landlords as well. Now below that strata - most of the poor lands were owned by local Gaelic clans and family groups of Norman descent. Now these clans and family groups tend to have strong local affinity. When you look at it parish by parish the family groups change. And, of course, the parishes in North East Clare and the Tuathas, the clan territories, are synonymous. Tuathas and Parishes have generally a one to one or a one to two co-relation. On the Clare side you have the O'Gradys - these would be the major clan in Inchicronan, the MacNamaras in the parish of Clooney, the Moloneys in Tulla, the O'Hallorans in Feakle, the O'Grady's in Tuamgraney, the MacSheeda MacNamaras in Mountshannon, and the Burkes in Whitegate. Now, you have to remember from about 1574 onwards the Parishes of Mountshannon and Whitegate are actually part of Galway. And they remain in Galway up until the very end of the 19th century. On the Galway side a host of minor O'Shaugnessys share the parish of Beagh with their clan chieftain. In Kilbeacanty you have the Fahys. The Fahys vie with the O'Devillys in Peterswell - called Kilthomas at that stage. And then a clan that I have never come across, MacCooge. 'MacHugo - they would be in the Derrybrien area' (Mary Coen contributes from the floor). And they're in Killenadema which is the Derrybrien area. The uplands of Ballinakill is home to the Burkes. The Earl of Clanrichard is a Burke - but the Burkes that are living in Ballinakill are behaving in a very different way - they are actually behaving very much like a Gaelic clan. When I looked at the way they owned the land in the uplands in Ballinakill, they seem to be practicing a type of transhumance farming which is very much typical of the Gaelic clan approach to land management. And they reminded me of the O'Hehirs in the Ben Dash, Kilmaley/Connolly area of Clare. They had the same way of organising their land. So these are the Burkes of the upper regions of Ballinakill - even though they are of Norman descent, they were actually behaving very much as Gaelic clans. Then we go to the Hynes, who were a significant presence in Kilmacdough. The Maddens are recorded in Tynagh and Licmolassa which is the parish where Portumna is. In the parish of Kilteskill and Leitrim the MacCoogey are prominent again. And the Donnellan family are very strong in Dunira. Galway city merchants such as the D'arcys, Lynches, Blakes and Martins also feature on both sides of the border. So the D'arcys are significant landowners in Tubber. The Lynches are significant land owners around Ballyvaughan but they are also significant landowners around the Gort region. And then Blake of course is a significant landowner around Barefield. He is also a significant landowner around the Gort region. You have also the Martins. Names which occur infrequently on the Galway side are Lennon, Dolphin, Sweeney, Daly, McMiler, Herron, O'Dolan, O 'Meony, Yelverton, McGillakelly and Tully. 'Dolphin is in Turoe' (Kieran Jordan contributes). 'Yellverton is across the bridge in Portumna' (John Joe Conwell contributes). O'Meaney - Meaney in the Feakle area - is also a strong name. The O'Meaneys were related to Biddy Earley so Brian Meaney (Green Party Councillor) told me. Again when you are looking through names you are always struck by unusual names - The name that just jumped out at me was this particular individual called Brassil Mac Ferria Piontach O'Madden of Tynagh - that just struck me - such a great name. Do the Brassils out in Latoon have any connection? These are the family groups that existed - that had a strong presence in these areas before the transplantation scheme. When the transplantation scheme is exerted these people are moved sideways. And sometimes that involves them moving into the uplands and colonising the uplands and turning it into farmland. But what you do notice about these names is that they didn't go away. They stayed put. And this is the great thing - I'm always struck by this when you look at a geography of names - and Clare is the county that I have worked on most - is the incredible resilience of surnames in localities. Through thick and thin. They might lose their land, they become tenants, they might get lands back again, they might lose them again. They hold on. They stay. So you will find if you go into these counties or go into these parishes today you will probably find that the Fahys are a very strong presence in Kilbeacanty and the O'Gradys are a great presence in Inchicronan. During the 18th centruy, what we think happens is that the population increases steadily. We know in the 19th century by the time of the Famine the population of Ballinakill and Feakle is higher than it has ever been since. And then you have this dramatic loss of population. 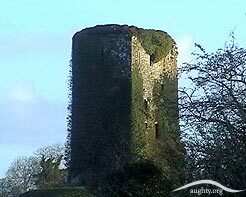 You will find that in the baronies of Loughrea and Leitrim on the Galway side, the barony of Upper Tulla register the biggest population loss in the western region of Ireland in the aftermath of the Famine, and of course the western area of Ireland was the hardest hit area. So if you look at the top ten parishes of Ireland to lose people I would say Feakle and Ballinakill are in the top ten of population loss. The population level is only making a slight recovery at the moment in these areas. With that, I've hopefully have given you some idea as to the historical geography of the Slieve Aughty region. Basically on the Clare side - the parishes that I would identify within the region are starting here in Crusheen, moving on to northern Clooney, Tulla, Tuamgreaney, Mountshannon and Whitegate . And on the northern side , I'm going to use the old Civil Parish names - Beatha, Kilbeacanty, Kilthomas (which I know is better known as Peterswell), Killnadeema, Ballinakill. And then other parishes that have an association would be Kilmacdough, Kiltartan, Ardrahan, Isertkelly (which is a very small parish), Kilchreest, Kilmeen, Kiltesken, Leitrim, Dunira and Tynagh and Licmolassey. So with that I'll shut up. The thing about the boundary going through the Aughties is that basically it is not a big boundary in people's minds. Crossing over and back - you're in Clare one minute, in Galway the next. The boundary between Clare and Galway in the Slieve Aughty region is of little consequence to the people that live there. I know that between Tubber and Beagh there is a rivalry in relation to hurling and all that. Unlike other boundaries in Ireland the Clare Galway boundary isn't an acrimonious one. Unlike the boundary between Waterford and Kilkenny or Tipperary and Kilkenny which are furiously contested. But Clare and Galway, they don't have that acrimonious relationship at all. In fact being from Barefield on the borders of Crusheen myself, I would know South Galway and Gort better than I would know parts of West Clare. For me Beagh is a neighbouring parish whereas my mother who's from Lisseycasey would regard Beagh as miles away. A parish in another county, another province. I remember doing a course in Ennis years ago with teachers and I asked them did they feel that Clare was part of Connacht or part of Munster, and being from here I had a strong affinity to Connacht or to the West and I discovered that basically there was just three of us that had that affinity. The other three people interestingly enough were Mary Heath from Crusheen and Josie O'Connor from Tubber and the three of us had this affinity with the west. Whereas everybody else in the room were very much Munster people. They saw themselves as Munster. To me the boundary between Crusheen and Beagh is a friendly boundary. It isn't like around Urlingford between Tipperary and Kilkenny. 'Is there an actual boundary across the mountains. 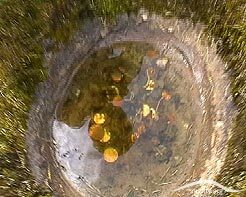 The way boundaries often follow roads or streams or rivers, or is it just a line across the bog?' (Kieran Jordan asks). I'm sure there is an official division of where exactly it is - but the fact is it varies from one official map to the other, which shows it's not very well known. But I'm sure if you have a farm on the boundary of Clare and Galway you know exactly which fields are in Clare and which are in Galway, I'm sure you do. But as I was driving from Lough Atorick to Derrybrien, I only realised I had crossed the boundary when I say a sign for 'Beagh Community Alert'. Again I find that sign a greater indication of where the boundary is than anything else. If you go from Crusheen up to Gort you'll see the 'Beagh Community Alert' on the left hand side of the road about a kilometre before the actual sign for the Clare/Galway border. Of course the boundary in that particular area runs along the road and that just happens to be the case - that's unusual.